From a purely statistical standpoint, Bob Dylan—Jewish and hail ing from Minnesota’s Iron Range—should reliably vote Democratic. Loath to have labels put upon him, his political outlook cannot be reduced to statistics. 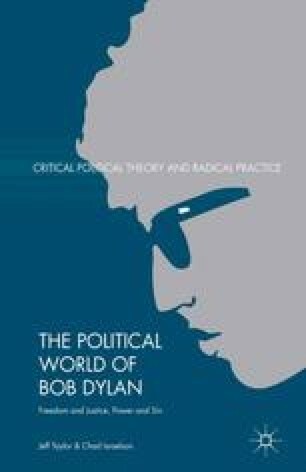 Dylan’s political world has proved too broad and independent to be classified simply as left or right, conservative or liberal, though he has often been assumed to be decidedly leftist. His political outlook is partly derived from the atmosphere of his home state and partly from his religious upbringing. Placed into those two cultures by birth, Dylan melded what he learned from them with traditional American ideals and roots music. His appreciation for the ideals of an America rooted in the past, a powerful sense of the sacred, and identification with the underdog coalesced into a belief system that transcended contemporary politics. This combination intermingled in the fertile and artistic mind of a sensitive young man and reappeared consistently over the years.